wood blinds| wood blinds, faux- wood blinds, Wood Shutters, windiw treatment, greater Nashville Nashville, Mt. Juliet| Morgan Drapery & Upholstery Tn. .
Transform any room with Faux Wood Blinds, a sturdy, strong, and cost-effective way to decorate your home. Available styles: Lake Forest® Faux Wood Blinds An affordable alternative to wood, these enduring, easy-to-clean blinds are engineered to withstand moisture. Lake Forest Premium Faux Wood Blinds The perfect counterpart for the Graber Wood Blinds throughout your home, Lake Forest Premium Faux Wood Blinds coordinate beautifully in matching color and wood grain. 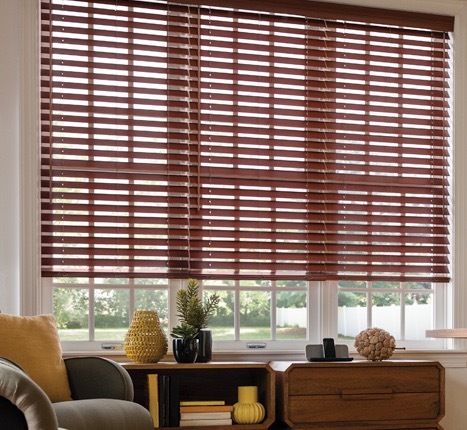 Traditions® Composite Blinds Get the look you want with the strength and resilience you need. Composite blinds combine the extraordinary look of wood with extra durability, making them a perfect addition to high humidity areas such as kitchens, bathrooms, or laundry rooms. 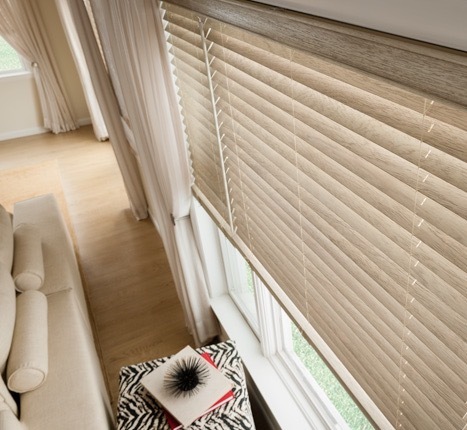 Where traditional wood blinds are not recommended, these perform beautifully. Used in furnishings for centuries from the most elegant carved filigrees to the simplest Shaker chairs, wood can embody any style. From rustic to ultramodern, wood can take on a variety of paint and stain colors, setting the tone for your living spaces and carrying an aesthetic theme from room to room. We start with the basics—superior materials and craftsmanship—so you can focus on the details that will make your Graber Traditions Wood Blinds the perfect addition to your home. Whether your home décor is traditional, contemporary, or eclectic, versatile Graber Traditions Wood Blinds can add warmth and beauty to your living spaces. MORGAN DRAPERY & UPHOLSTERY INC. Copyright © 2016 Morgan Drapery & Upholstery inc. All rights reserved.